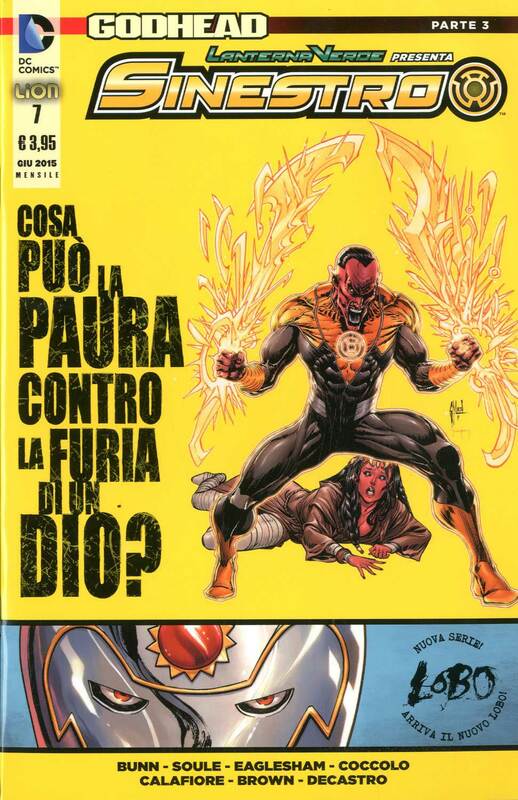 Italian readers seem to revere comics from the U.S., but they’ve got a pretty good thing going where they are. When some people travel, they like to shop. Suits in Hong Kong, for example. In Florence, there is store after store filled with leather goods. Me, I like to go comics shopping. Paris actually has a comic-book district in the Latin Quarter — imagine, four or five shops in the same neighborhood — not counting those elsewhere in the City of Light. It’s magnificent. I especially like going Big Two shopping. Of course, you can get just about any Corto Maltese book in Venice, but I don’t read Italian, so irony of ironies, I’d rather get those back home. No, for me the excitement comes in the packaging and the presentation. The familiar yet exotic. 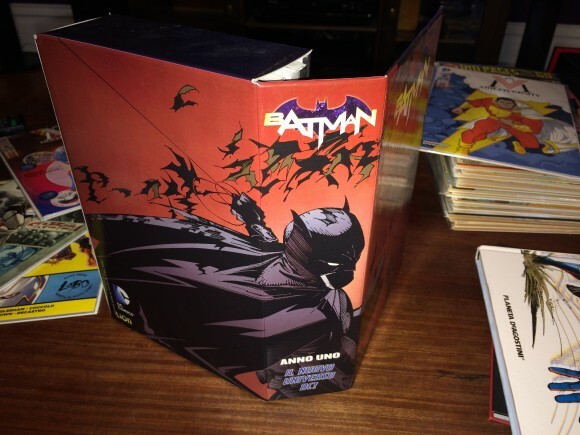 — The annual comics box: RW Lion, DC‘s current Italian publisher, produces boxes designed to hold a year’s worth of a given title. It’s decorative, so it would look nice on a shelf, but there’s the added enticement of a special variant that only comes with the box. 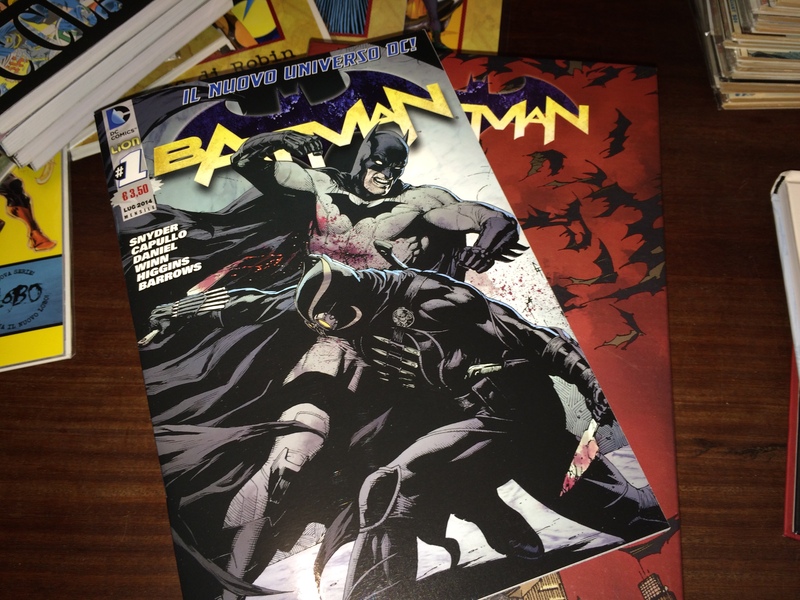 I picked up a Batman box, with a Batman #1 variant, for about 9 euros. Prices vary widely, I’m told, but I plan on making use of the one I got. — Oversize books: Deluxe really means deluxe. 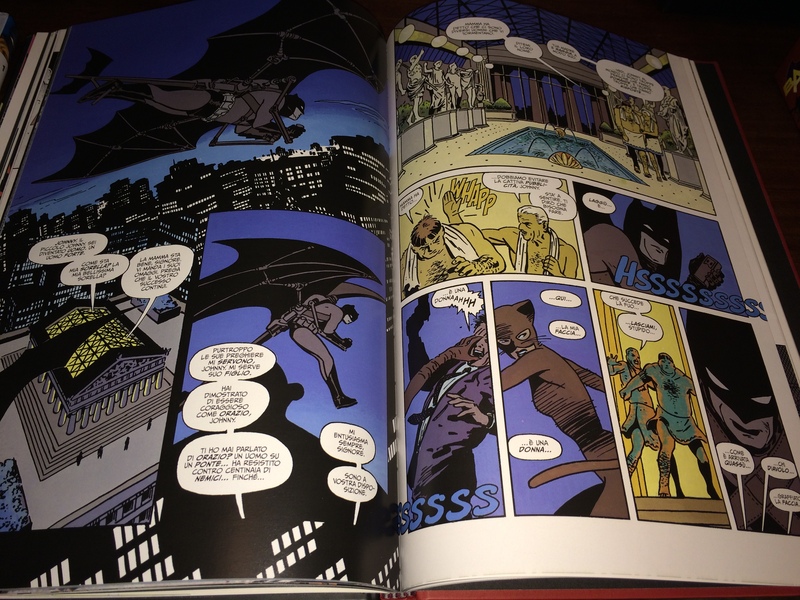 In the U.S., a deluxe book by DC is bigger than the standard trade size but smaller than an Absolute edition. In Italy, a deluxe edition is about the same as an Absolute in dimension — though not heft — but very affordable. 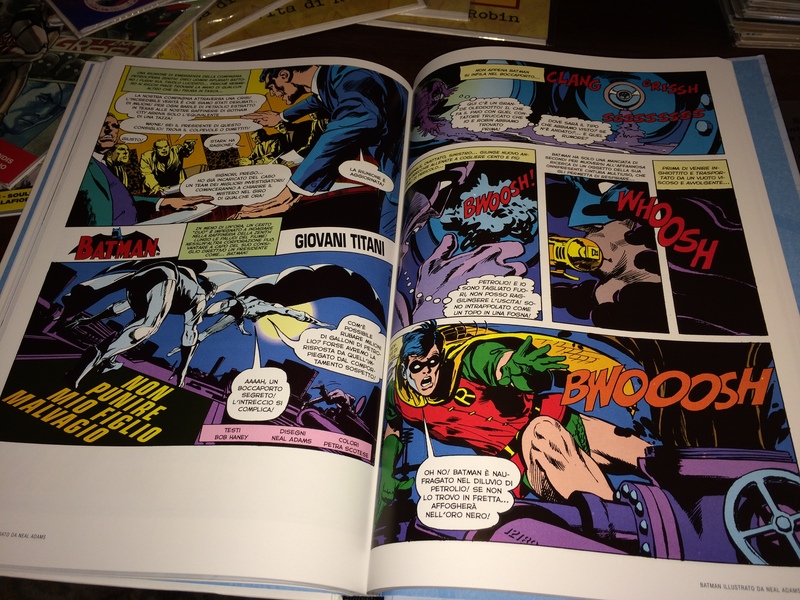 I picked up Batman Illustrated by Neal Adams Vol. 1 and Batman: Year One by Planeta D’Agostini — the prior DC publisher — for about 22 euros each. 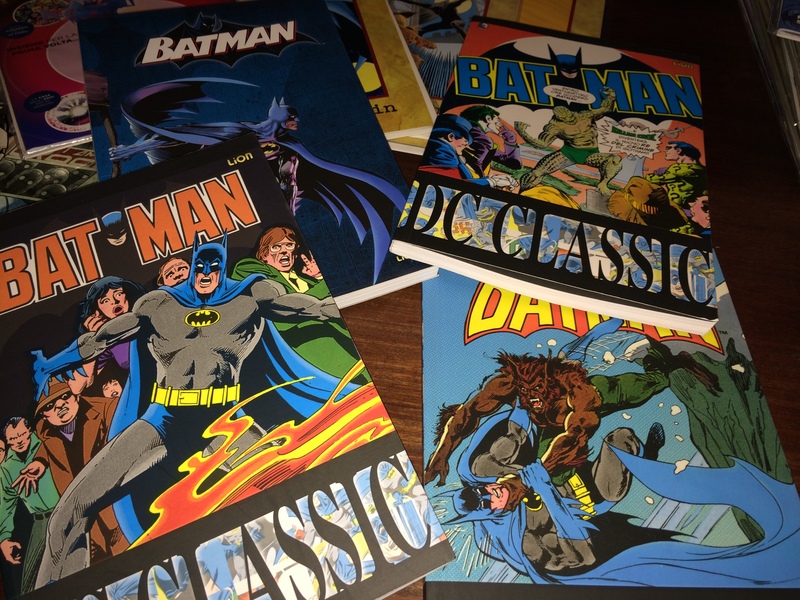 Getting to see Neal Adams’ and David Mazzucchelli’s Batman art in this size isn’t something you typically get in the U.S. Since I know these stories backward and forward, it doesn’t bother me that I don’t understand the words. — Reasonably priced reprint trades. 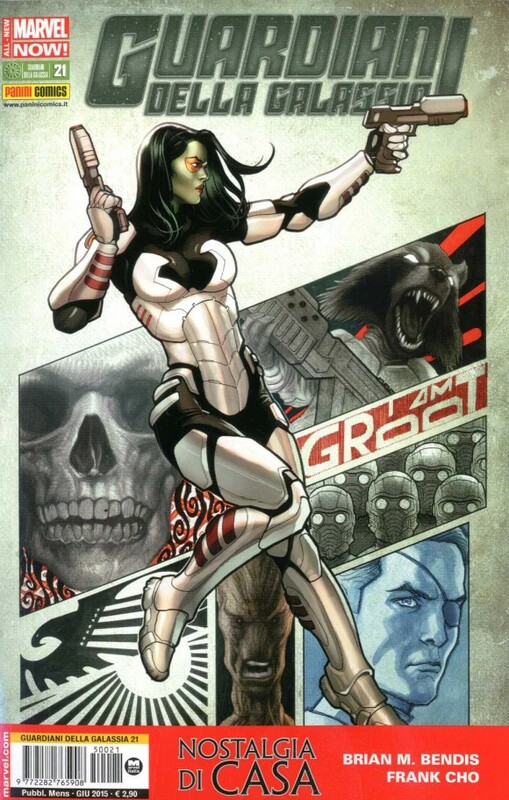 Panini, which handles Marvel, and RW Lion, produce a steady stream of Silver and Bronze Age paperbacks. Some are specific landmark stories, which you see in the States, but there are also regularly published series that present comics in chronological order. The four below range in price from about 8 to 14 euros each (though the one in the upper right was a gift from my friend, translator Francesco Vanagolli). Of course, there’s not necessarily the same spectrum of choice that you get in the U.S.
Aquaman, for example, doesn’t get his own book. Instead, he’s relegated to backup status in a title headlined by the Flash and Wonder Woman. Then again, the typical comic includes about three or four issues of American comics, at about 4 euros total. That’s a bargain right there. The American market is far more consistent and diverse, no question. And some of what the Italians do wouldn’t necessarily be cost-effective or even embraced here. But I liked a lot of what I saw and came away just a little envious. I’m in Spain on holiday just now and they have the same reprint schedule as the Italians. The local comic shop has no direct from the US comics, however the amount of reprints of almost current and classic silver and bronze age is impressive, reasonably priced and with high production values. Although I have most of the story lines in one form or other, if I could read Spanish I’d be filling my boots! “The familiar yet exotic.” YES! That’s exactly how I feel as well when coming across comics in Europe, particularly in Italy. And aren’t those huge books gorgeous!